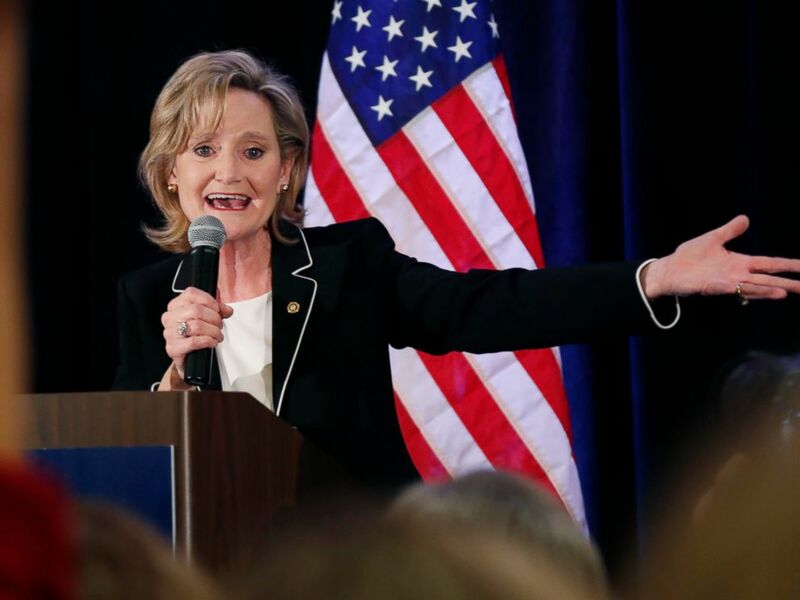 Despite calls for refunds, new campaign filings show Mississippi Sen. Cindy Hyde-Smith kept $50,000 in donations from major companies like Walmart and Facebook in the wake of her controversial special election victory in November. The latest Federal Election Commission filing — released amid the government shutdown at the end of last week — showed that Republican Hyde-Smith did not issue refunds to most of the corporate donors who asked for their campaign contributions to be returned in November in the wake of her “public hanging” comment. Republican U.S. Sen. Cindy Hyde-Smith calls on her family members to identify themselves as she celebrates her runoff win over Democrat Mike Espy in Jackson, Miss., Tuesday, Nov. 27, 2018. Hyde-Smith, who was locked in a contentious battle to hold onto her Senate seat against Democrat Mike Espy, faced fierce blowback over a racially tinged joke about “public hangings” that became public after a video taken by a political tracker following her campaign was posted on Twitter. “If he invited me to a public hanging, I’d be on the front row,” Hyde-Smith said in the video, referring to a rancher who supported her campaign. A host of companies, including several of the country’s most high profile, denounced Hyde-Smith’s comments and publicly demanded refunds. Among them were Aetna, Amgen, AT&T, Boston Scientific, Facebook, Google, Leidos, Major League Baseball, Pfizer, Union Pacific and Walmart. Hyde-Smith apologized publicly at the only debate between the two candidates. She ended up defeating Espy in the runoff on Nov. 28 by about 60,000 votes. The New York Times reported earlier this month that MLB received a refund, but in fact, MLB, along with Amgen, only received their donations back because the transactions were cancelled before being processed, according to the FEC filing. The Jackson Free Press reported that the refunds totaled more than $50,000 and the campaign’s refusal to issue the refunds is likely due to the fact that Hyde-Smith only had $63,744.51 cash on hand at the end of her campaign. The only refunds the campaign reported in the filing were to the owners of the San Francisco Giants, Charles and Ann Johnson, and Seattle business owner Peter Zieve, who was sued for discriminatory hiring practices against Muslims, according to the Seattle Times. The campaign confirmed to NBC News a week before the Nov. 27 runoff election that they returned the donation. Hyde-Smith did not immediately respond to a request for comment from ABC News. Candidates are not legally required to fulfill refund requests.